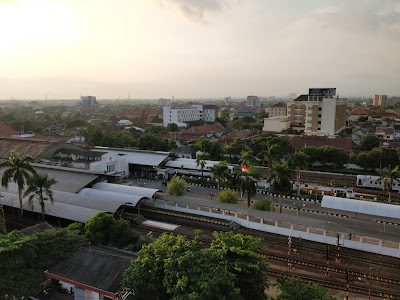 After an early morning rise and breakfast, we walked the short distance down the hill to the train station in Bandung for the 07:20 direct train to Yogyakarta. We got through the ticket check and boarded our train with plenty of time to spare, this time we were in what they call ‘Executive’ class, where the only real difference is the seats are slightly wider and can recline back a bit further. The trains here in Indonesia are clean and efficient, probably more so than back in the UK! The journey time was approx. 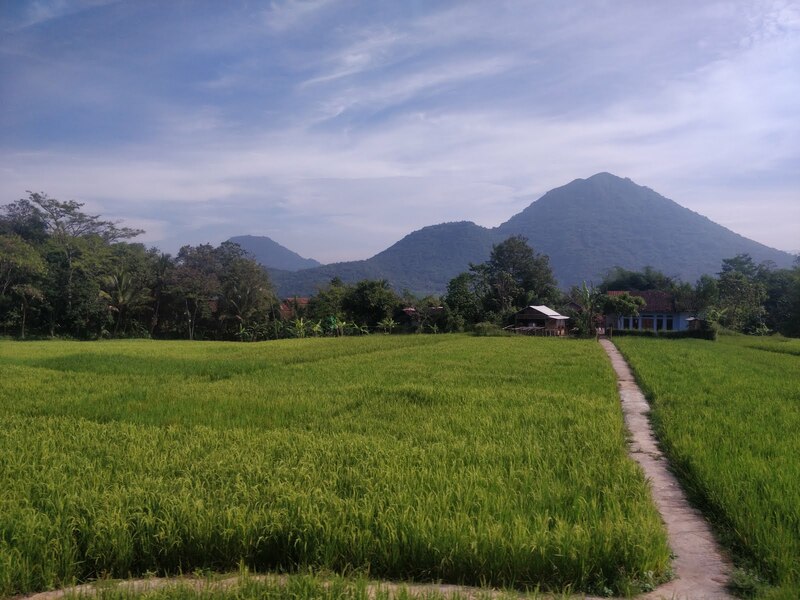 8 hours, and we were soon out in the countryside passing some spectacular scenery with the hills in the backdrop and rolling paddy fields everywhere. It’s interesting to look at, as we pass through small stations which seem in the middle of nowhere, yet are full of bustling life and the local kids wave as the train goes passed, it reminded me of Myanmar. We rolled into the main station on Yogyakarta pretty much bang on time, and as usual in Indonesia once we entered the street, a load of taxi touts and becak drivers shout towards you, however our hotel was a 5-minute walk from the station, so off we went to find it. We had picked another centrally located hotel, we have found on this trip that usually the cheaper ones we stay at are just a little walk out of town, say 20-30 mins walk. But in paying a couple of pound more, we can get something more central and saving money on Grab taxis more often. This time we were in the Hotel Neo, and as soon as we got checked in and arrived in our room, the layout was all too familiar. On checking it out, the Favehotel we stayed at in Jakarta is part of the same group of hotels, as are some other brands too. It had a pool (which surprisingly we didn’t use) and we had a breakfast buffet which was decent. There was also a rooftop bar are where we headed up to for a beer once or twice and it had a not bad view of the surrounding city. Having collected a few days washing, we headed out to find a nearby laundry and just around the corner from our hotel, there was a little alleyway. This was full of ‘Losmen’ which are basically homestays/guest houses, restaurants, tour agencies and a few laundrettes. After dropping our bag of clothes off, we went into a couple of the agencies to get some quotes. 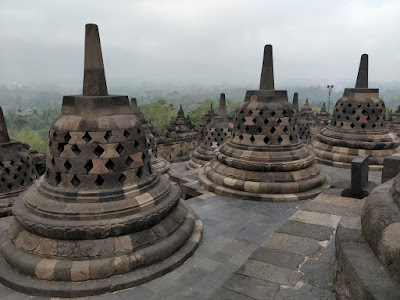 The main reason we came to Yogyakarta was to see the nearby ancient temple complexes of Borobudur and Prambanan, the former is also known as a good spot for sunrise. We got a few prices and some information to look over before we booked anything. Then it was just a wander round the 2 busy backpacker streets near our hotel called Jl. Sosrowijayan and Jl. 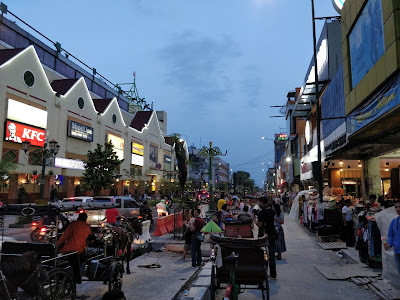 Malioboro, which are busy streets lined with ‘Warungs’ which are little stalls selling practically everything you need. After returning to the hotel to get freshened up, later on we went to one of the local restaurants called Bedhot that we spotted earlier up one of the alleys and it was cheap too. I opted for a pizza and Sadie had Beef Redang, both were delicious and a nice cold beer washed it down. We then went to a bar called Oxen Free for a drink, and there was a couple of guys setting up to play an acoustic guitar set. The played a blues song for a soundcheck, so Sadie wanted to stay for a little while to watch them. When they started they played a couple of blues songs, but then started on cheesy pop hit stuff, so we left and went for a walk around the town. Just on our way back to the hotel, we seen a bar called ‘Lucifer’, and stopped there for a quick one before we headed back. The next morning, we decided to go and visit a few of the tourist attractions in the city, and then book a tour for the next again day. So, after a huge buffet breakfast, we went to the ATM outside the hotel, only to find (or thought we had found), it wanted to charge us a fee as had an amount in IDR displayed above the machine. We then headed along Malioboro St and tried to find an ATM. On Google Maps, there was one apparently in or around a mall, and after searching everywhere for it, we had to ask a security guard where it was, who pointed up and indicated 3rd floor. On finding another 5 or 6 machines, they all had an amount displayed but some were 50,000 IDR (about £2.50) and some had 100,000 IDR (£5). It then clicked, this was the denomination of note it had in the ATM, and wasn’t the withdrawal fee! We followed the street up towards the ‘Kraton’ which is a presidential palace complex and one of the top attractions in the city. Perhaps we were missing something, but we both found it a bit disappointing and didn’t stay that long. 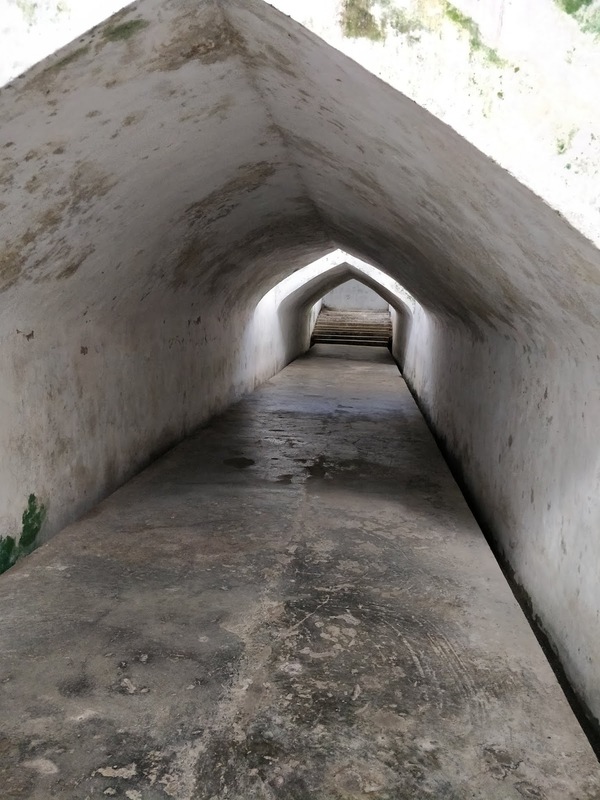 Then we headed to find Taman Sari, which is a former royal garden within the old city walls, and has underground tunnels and a bathing complex. We stopped for a quick cold drink, and then entered from the side of the café we were at to where we thought we had to enter. Turned out we had entered in the wrong direction, and a guide tried to point us in the right direction, but when we explained we didn’t need or want to pay for a guide for a tour, he just abandoned us. So, we were within part of the complex, but with no map, signs in English or anywhere obvious to buy a ticket, we ended up walking around the place in circles looking a bit lost for a while. A group of schoolgirls then accosted us again (happens a lot here) to ask us some questions for their project, Sadie kindly obliges and answers them as best as she can, all whilst either getting filmed or audio recorded. And then off we go to try find the actual bits of the complex we wanted to see, walking through tunnels but sadly I managed to bump my head on a low doorway, and it bloody hurt so I wasn’t in the mood for walking round looking any longer, so we jump in a Grab back to the hotel. 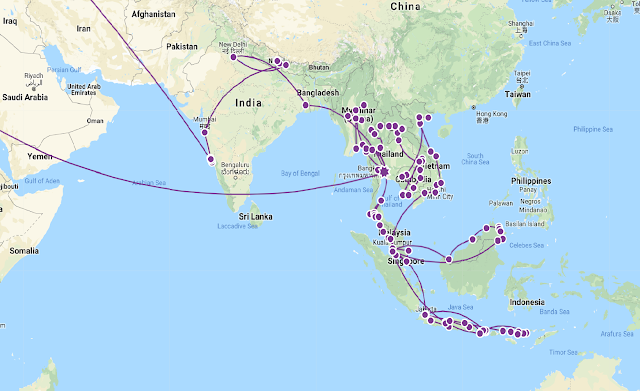 We spent most of the afternoon doing more research on local tours and booking future hotels, then we went around to one of the tour operators we spoke to the previous day. 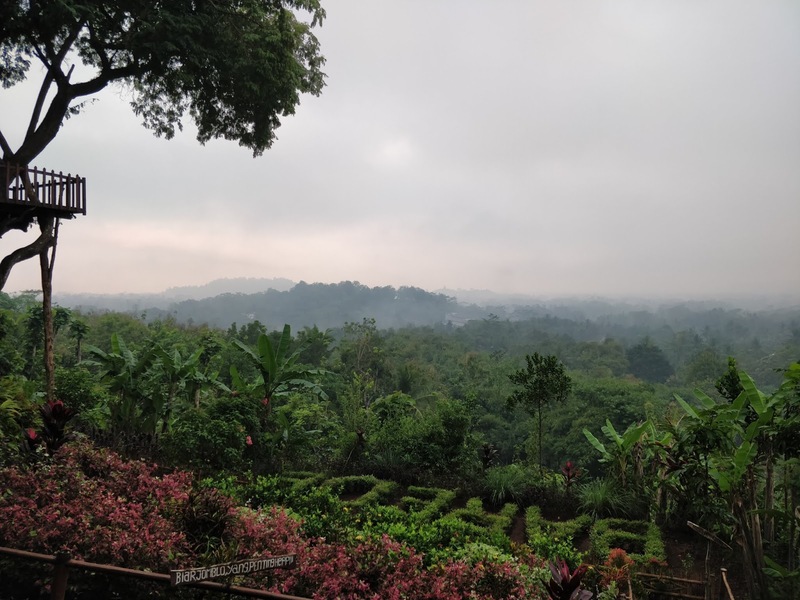 We had decided to book on to do one of the sunrise tours to Borobudur and then on to Prambanan the following day, and then hire a car/driver the next again day to take us to a few more places we wanted to see. We paid for the first tour, which was 300,000 IDR (£16) for around 8 hours and we also put a deposit down on the 2nd day’s one, and as we had to get up at 03:00 the next morning, we had an early night, but not after having a couple of tasty local dishes at a nearby restaurant. Next morning… it was a struggle getting up that early, but we did and collected our pre-ordered breakfast box from reception, and then got picked up in a car and off we set for the hours journey to the temple area with 2 other tourists and a crazy driver, who seemed to be determined to overtake everything in sight. There were 2 options for this tour, one which involved you paying a vast premium to get into the already over-priced complex before 06:00 by going to the only hotel on site who charge more to let you in via their property at 04:30, allowing you to enter the temple and climb to the top for sunrise at around 05:30. 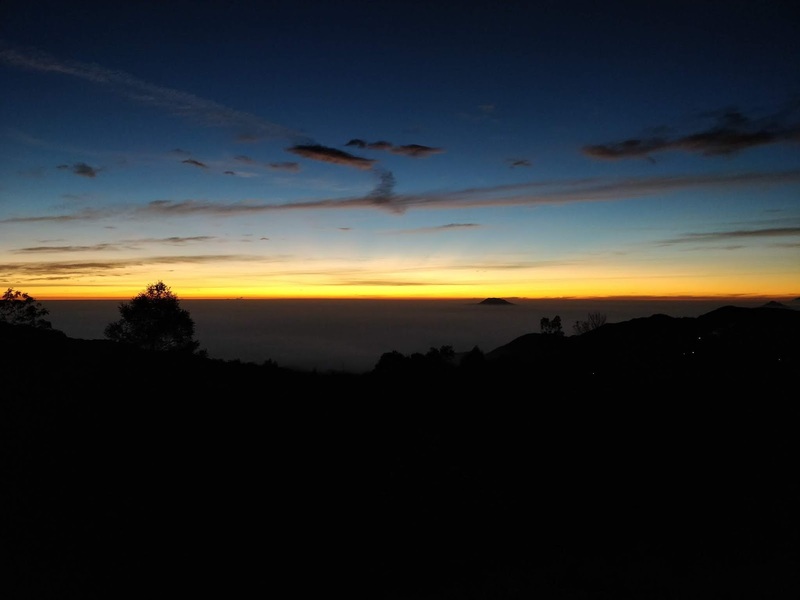 The other option is to go to a nearby viewing point, the one we went to was called Bukit Barede, pay a small fee to get onto their land, and then ascend a hill for about 10-15 minutes to get to a viewing platform. This was the option we opted for, and so we paid 10,000 IDR (£0.54) and along with perhaps 20-30 other people, off we set up the hill. It was already cloudy, so we didn’t have any high hopes of seeing an amazing sunrise, and after sitting about for around an hour, we headed back down to the car park without seeing anything spectacular, so we were glad we didn’t pay the premium price. Borobudur is the world’s largest Buddhist Temple built in the 9th century and an UNESCO world heritage site, so I guess the entry is justified as it is pretty impressive as you walk through the gardens and it appears in front of you. It has an interesting history attached to it, however as usual we decided not to take a guide round and just explored the massive structure at our leisure. 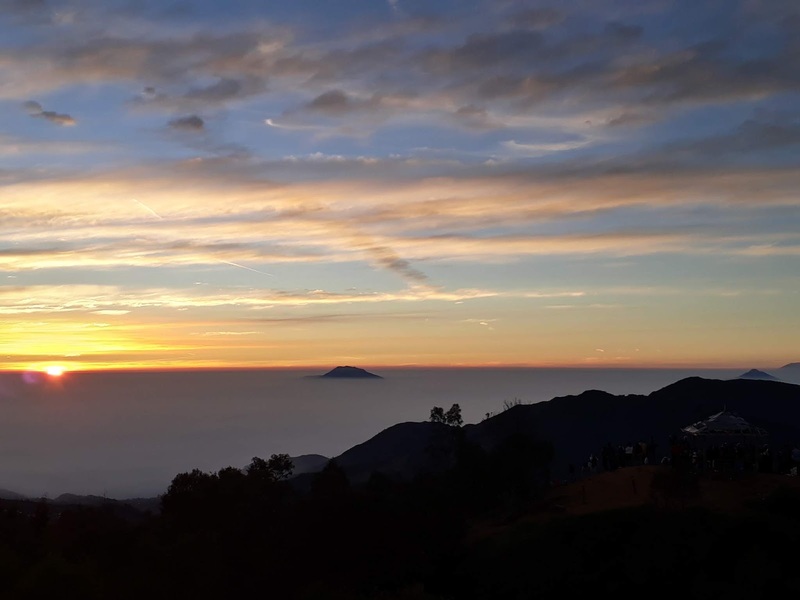 At 35m high and around 123m square at the base, it is built up over 6 levels and the view from the top is gorgeous where you can see volcanos and mountains surrounding the area. We spent about 2 hours exploring here, then we headed back to the car. The exit took you out into a rabbit warren of market stalls, most were closed, yet you had to walk round and round before you eventually escaped. Sadie had already eaten her breakfast box, which contained 2 slices of dry bread, a boiled egg, a banana and a pastry. I didn’t bother with mine, and instead bought some scrambled egg & toast from a little stall at the car park, which was cheap and did the job! 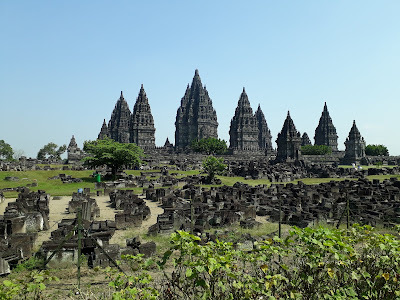 We then headed about an hour east to Prambanan Temple, again with the crazy driver. 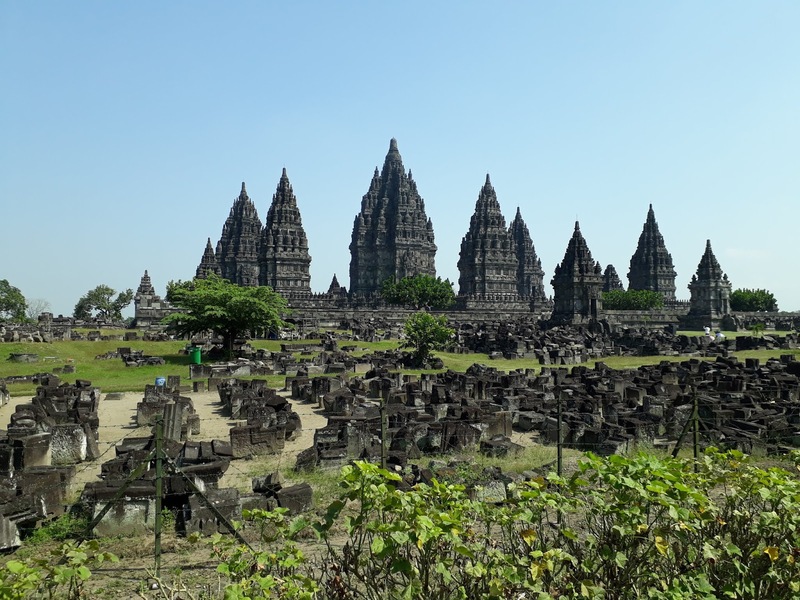 Prambanan is another huge temple complex from the 9th century, however this is a Hindu temple, again a UNESCO site and the largest of its kind in Indonesia, in fact one of the biggest in SE Asia. This has an impressive 47m high central building, surrounded by equally impressive smaller ones. Again, we spend around 2 hours wandering around here, Sadie went off to explore a few more in the area whilst I sat and hid from the scorching mid-day sun. After that, we headed back to our hotel, and as we had been up since silly o’clock, we both had a much-needed afternoon snooze. As we decided we didn’t want yet another early rise the next day, when we went out for dinner, we popped in to let the tour guy know we were cancelling tomorrow’s trip, before heading to Oxen Free again. We ordered our food, I was still sitting waiting on mine after Sadie had finished, so a quick word with them and they brought out my Chicken Sandwich, which whilst tasted ok, wasn’t the best and the fries were cold… better sticking to local dishes and not going ‘Western’. 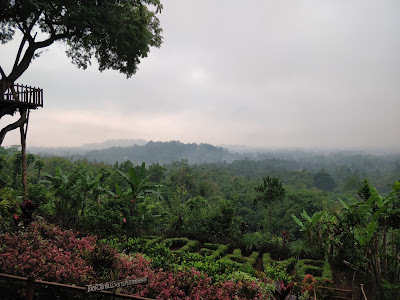 We had a lazy last full day in Yogyakarta, doing admin stuff and research, and Sadie had found a place for dinner called Madam Tans, so we headed up there. We both ordered local food, Nasi Campur Dewata & Nasi Lemak ala Madam, which are rice platters with various chicken/fish sides and other stuff, and then a dessert. 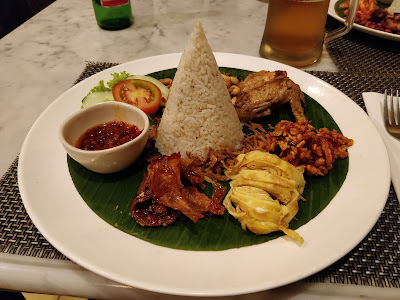 All of it was delicious, and probably my favourite meal so far in Indonesia. After another fill your face breakfast buffet, we order a Grab to the bus terminal, which like most towns here, are (in)conveniently placed about 5km outside of the centre! 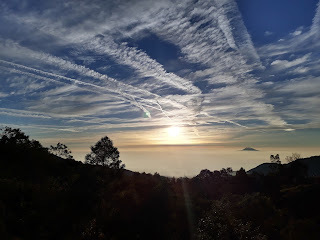 Our journey to and from Dieng was all based on research online and guess work, as there was no way to pinpoint exact schedules or indeed fares. All I had really found out is we needed to get to this bus terminal, then get a bus about an hour north to Magelang. 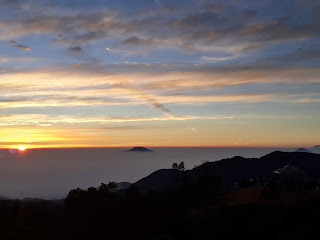 Then we would have to change to another bus to Wonosobo, which is a further 2 hours journey, before changing yet again to a minivan that would take us the final hour up the hills to Dieng. I had some rough figures for what each leg of the journey would cost, so hopefully that would be enough information to get us there! 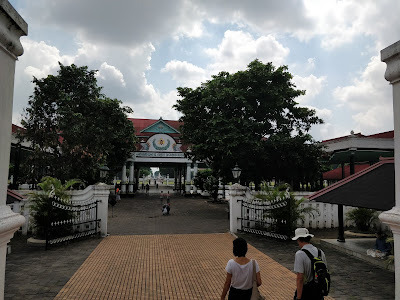 Our taxi dropped us off and immediately someone came to ask where we were going, and on saying Magelang, we got quickly ushered towards a waiting bus and on we got. 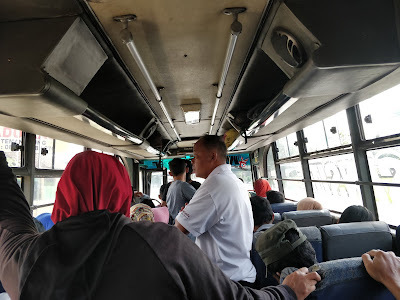 As with most journeys on local buses across SE Asia, you are usually the only tourists on the bus, so expect a few stares and hellos, but the people are friendly enough. There is usually a ‘conductor’ who collects the money at some point in the journey, then another guy who stands near the back door shouting the destination loudly at anyone standing next to the road, and helps anyone on and off with luggage. I paid our fare, which was 15,000 IDR (£0.80) for this part of the trip as expected, and off we went. One thing that made me chuckle on this journey was we were sat behind a dumper truck that had stopped at a set of lights, as we waited I noticed 4 or 5 young lads in white shirts (looked like school uniform), clamber up the back of the truck and jump inside before it set off again… am pretty sure that wasn’t standard school transport! An hour later, we arrived at Magelang, and again as soon as we got off the bus here, we were shouted asking for our destination, and before we knew it, we were on the next part of our journey. This sector was 2 hours long to Wonosobo, we paid our expected 25,000 IDR each and off we went. The driver of this bus was a bit crazy (this became a theme for the next couple of days) as we sped through the countryside heading up the hills, the scenery was stunning, where we could see 2 of the many volcanoes in this region, Mount Sindoro and Mount Sumbing. These were very impressive, especially as there was what seemed like smoke coming from the top of the latter. On arriving at Wonosobo bus terminal, we both needed a drink, so declined the shouting men this time and went over to a little stall to chill for a bit. 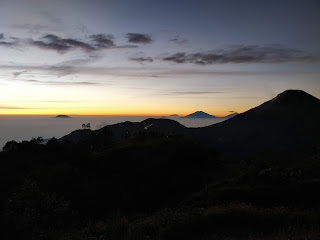 Once we were ready to go, we got back to where the buses drove through, and a smaller bus pulled up and asked if we were going to Dieng, to which we agreed. There was only a couple of people on the bus, and the driver/conductor who found it hilarious that we were on their bus. So much so, we got asked to go down the front and get a photo taken with the driver. We confirmed again that we were going to Dieng, and after handing over 30,000 IDR to them as expected for this part, off we went through the town of Wonosobo on our way to Dieng. We had only been on the bus about 10 minutes, when they stopped at a crossroads and said we needed to get off here and get into a smaller minivan which was waiting. Thinking nothing of this, off we got and got onto the other vehicle as asked, as this happened to us a couple of times in Thailand, where you get passed onto another waiting vehicle to complete the journey. As we sat down in the minivan, we got asked for our fare of 20,000 IDR to take us to Dieng… which took us by surprise as I had just given the last guy what I thought was enough for this journey. After a bit of debate, using Google translate and slightly raised voices, we soon realised it was the young lad on the last bus who took what should have been the complete fare and kept it, when realistically it should have only been 3000 IDR not 30,000! Not the end of the world as it was only a £1 or so, but the principle that he kept it. We got off the bus, hoping to catch the cheeky sod the next time they came around the block, but never so we eventually got some of the locals to help us get another bus to Dieng, having to pay again... lesson learned is to confirm destination, fare and if need to change transport for future reference! This last part of our journey took around another hour through some amazing views of the volcanoes and surrounding peaks. 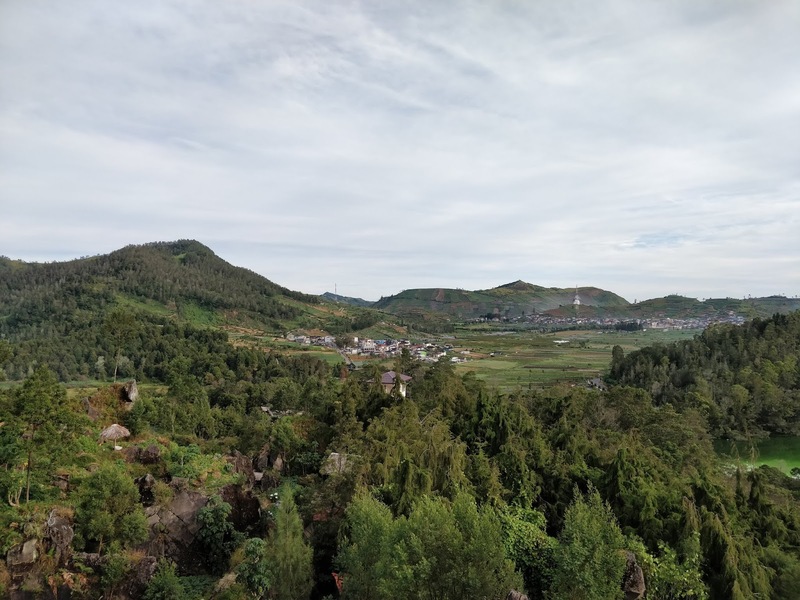 We soon arrived in Dieng, which is a small village around 2000m above sea level, and as soon as we got off the bus, we were faced with far cooler temperatures than we were used to, I think it was Nepal that we last felt the cold like it was here. 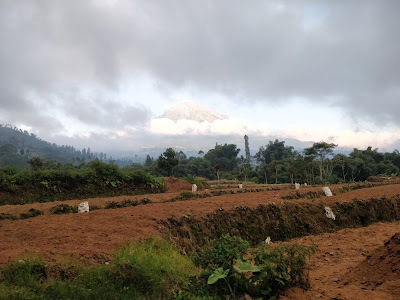 There is a shortage of accommodation options in Dieng (a lot of people prefer to stay in Wonosobo and travel up), but I had found one homestay that seemed to have some half decent reviews, as many didn’t even feature on TripAdvisor, Google or even the internet at all. It was £8 a night, and we had it booked for 2 nights so we could do the tourist stuff the next day starting at sunrise, and then have a chill day before we move on again. We got shown to our room, up a small staircase to the 2nd floor, which had about 8 rooms surrounding the upper lobby. Room we got shown was tiny, so after a quick discussion, we moved into one of the other empty rooms which had more room. It was a basic room, and for the price it was ok but we had no sink in the bathroom, no towels or toilet roll and it wasn’t the cleanest. But it would do for a couple of nights, so we settled in and then went out to find some food for dinner. Like accommodation, there wasn’t much to choose from here, and after walking up and down the small main street for a bit, we found one place that had tables inside and people in it. The food was basic, cheap and filled a hole, then we went back to our homestay. As we had still to arrange our trip out for the next day, we managed to find one of the staff who spoke some English, and got a price of 400,000 IDR for a car/driver for 8 hours, which turned out to be more than enough time. The downside of the deal is that it is a 04:00 start again, so hopefully it would be better than the last one! 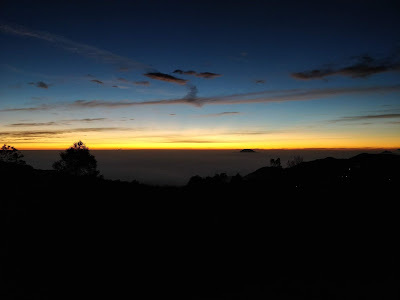 Dieng Plateau is a caldera complex that was formed from an old volcano called Mount Prau, and has several ‘attractions’ that people travel all the way up here for, but the highlight is a trip up Sikunir Bukit Dieng, which is a viewpoint again famous for its sunrise over the plateau and surrounding mountains. A long time ago, after Prau erupted, the caldera filled with water, but that has long gone however there is still volcanic activity with sulphuric fumes and poisonous lakes. Our alarm was set for 03:30, which wasn’t going to be well received once it went off, but a quick check of the weather and a clear sky forecast soon got us out of bed and dressed ready to meet our driver for the morning. The initial plan was to go up Sikunir, then return to the homestay for breakfast before we continued with the rest of the stuff, anyway it didn’t turn out that way as we got breakfast at the end of the trip. So, we set off at 04:00, and drove about 20 minutes to a car park at the bottom of the hill, grabbed a much-needed coffee from one of the local sellers and set off on the path up the hill. There was a decent size group who had the same plan, as we followed each other up the dark hill with torches, headlights and the occasional light showing the path. I had read a little tip online about this, that near the top there is a rest area and the path splits. The left would be the shortest, but not quite the highest point, but the path to the right took another 10 minutes and would be a far better view. We got to where I thought the split was, took the right-hand path and after a scramble through some trees and up a steeper hill, we got to a viewpoint that would indeed give us an amazing view over the plateau. By now it was about 05:00 and with around 30 minutes to go before official sunrise time, we could see it starting to get ever so light on the horizon. The sky was pretty much clear, with only a few wispy clouds on the horizon where the light was. All going to plan, we could be in for something special here, and we sat patiently with about another 10-15 people at that location. We could see the other viewpoint a bit lower, but not far away and there was probably about a hundred or so people all in who had made this early morning journey. The surrounding mountains and volcanoes around the plateau slowly became visible as the sun began to light up the sky with its orange glow appearing, and as the peaks of previously hidden mountains came into view, you could see the clouds all around with the odd peak appearing above them. Over in the distance you could see the plumes of smoke come from the top of a volcano, I think it was the one we seen the day before ‘Sumbing’, but apparently there is 8 you can see from here on a clear day. Then a short while later, the sun appeared on the horizon, giving an amazing show on the surrounding clouds, it’s hard to put into words how stunning it was, definitely the best sunrise I have seen, so will just let the pictures do the talking (Link at bottom), but even they don’t do it justice! We sat for a while till it became daylight, and then started our descent down the hill back to our waiting driver. It was now around 06:30 and we thought we were going back for breakfast, but someone obviously forgot to tell our non-English speaking driver, as we pulled into another car park. This point was a viewing area for Talaga Warna, which is a lake which the colour often changes, due to the sulphur content. 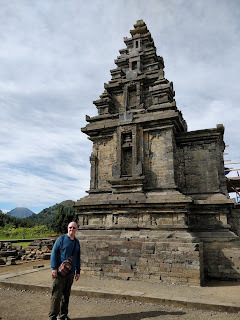 I knew we would be visiting this, and was happy to pay another 10,000 IDR to get up the small hill to see it from here, as I had also heard if you go to the actual lake to walk round it, it is about 100,000 IDR each and not even worth that as you can’t get a good view anyway. So off we went, climbed the few steps to the first viewing platform, and there it was looking very green and beautiful. We took a few pics then went back down, and off we got into the car again to our next destination. Next up was a stop at Kawah Sikidang, which is a huge volcanic crater with a gas exit hole, which results in the mud bubbling away. The place stinks of sulphur, you wouldn’t want to spend long here without a mask on, and as we managed to somehow get in without paying, we didn’t hang about long. 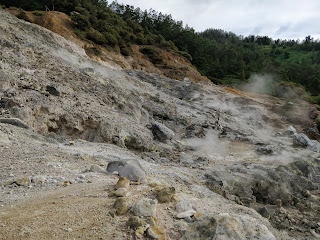 The place was a bit run down, with a lot of vendors trying to sell bags and rocks of sulphur, litter lying about and even one tourist who decided to get his top off and climb over the safety barrier for that all important ‘Instagram’ pic… just imagine if he fell in the steaming hot bubbling mud! It was a pretty surreal place to be, with all these little mud streams bubbling away and sulphurous rocks everywhere, was a bit like a scene from another planet. 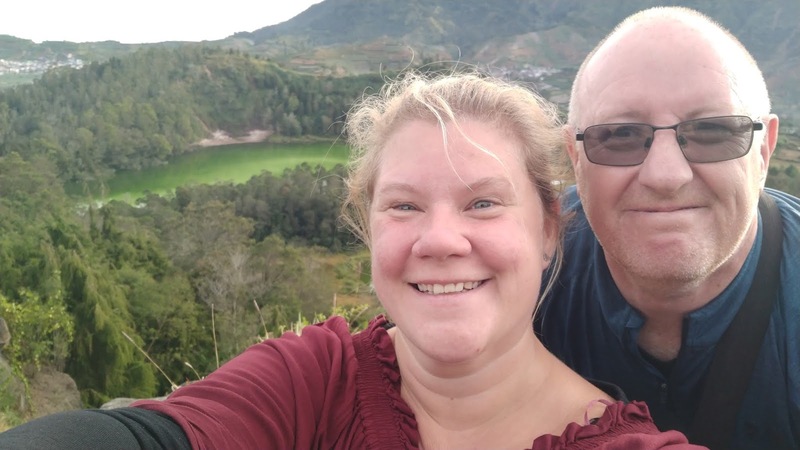 We both knew by this time that breakfast wasn’t happening and our next stop was a small museum which took about 10 minutes to walk round and was full of mainly old stones from temples and stories about the surrounding volcanoes, all in Indonesian. Our final stop was at an ancient Hindu temple complex, from the 7th century and not much is known about the history of them, but one temple was getting completely rebuilt and it looked like a huge task as I watched one guy painstakingly cement a couple of blocks together. By the time we wandered round the few temples here, we were tired and hungry and kind of glad when our driver told us it was time to return to the homestay. When we got back, we got a breakfast of rice and egg and then went to sleep for a few hours, well tried to with the very loud call to prayers from multiple nearby mosques, along with someone in the homestay doing some DIY and banging what sounded like a hammer every few minutes. 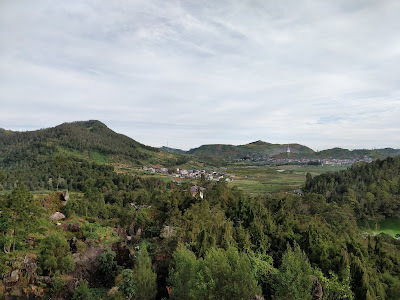 As we knew there wasn’t anything else to do in Dieng, and with the noise being a bit unbearable, we decided to look for a hotel in Wonosobo. We needed to go back there for the morning anyway for a bus to our next destination, plus there was more restaurants etc, so I booked us into a hotel there and then we packed our stuff and left around 2pm and got the bus back down the hill. The hotel I booked wasn’t bad, we had a nice large room with a nice view over some fields, and after having a shower (yet still no sink in the bathroom, must be a local thing? ), we headed out for some dinner. On our way down the main street, lots of kids were setting off fireworks from a local park, which were on sale out of car/van boots, and these weren’t the kind of fireworks you can pick up at Tesco etc, these were full on huge rockets and what looked like professional ones... no H&S here! We found a nice Chinese restaurant where we had a lovely dinner and then it was back to the hotel.